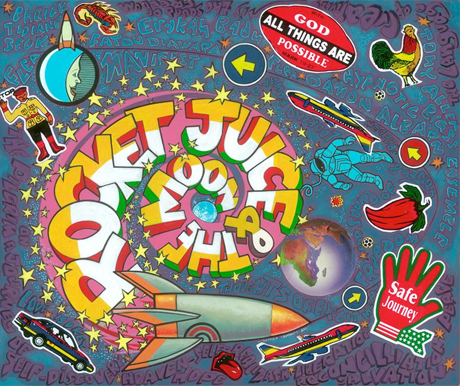 Blur/Gorillaz mastermind Damon Albarn, Red Hot Chili Peppers bassist Flea and Fela Kuti drummer Tony Allen unveiled their collaborative Rocket Juice and the Moon project some time ago, and they even shared a slew of live recordings back in the fall. Now, the trio have announced their debut album. The self-titled LP will arrive in March via Honest Jon's Records. However, as of press time, the exact date is unclear; The Wire says March 26 while MOJO Magazine reports March 12. UPDATE: The album is due out March 27 in North America. You can see the cover art above and the tracklist below. The trio recorded 18 songs at Albarn's Studio 13 in London, with additional touch-ups made in Paris, Berlin and Chicago. There's no word, though, as to whether all 18 tracks will make the cut. Guest contributors include Erykah Badu, Fatoumata Diawara, M.anifest, Cheick Tidiane Seek and the Hypnotic Brass Ensemble. While the album is said to cover a variety of styles, Allen told MOJO [via Stadium Arcadium], "It is all funk. Groove music, music that makes you dance. The audience don't want to sit and listen, they want to move their bodies. That is crucial, and Rocket Juice and the Moon will make them do that." He also said this of the group's recording sessions: "We leave egos at the door. We work in a very unique way. We don't say, what are we going to do? We say let's go for it, and we all play at once. Track by track we do it this way; transmitting something to each other, a musical idea, a melody. It's a transmission of inspiration. It's not 'You play this, you play that.' We allow each other to express ourselves. It's a question of being free of mind." Stay tuned for full album details to be announced. In the meantime, check out a small version of the album cover over at Honest Jon's website.